Greetings globetrotters and happy holidays! I hope that everyone back in the USA had a great Thanksgiving and enjoyed those Black Friday/Cyber Monday holiday travel deals in the iluv2globetrot travel community. If you are looking for a destination to trot to during your winter holidays, I can highly recommend a visit to Toronto. As a native Detroiter, I used to visit Canada often for weekend escapes and holidays. This year due to Canada’s 150th anniversary there are loads of things to do and places to visit throughout Canada, including the dynamic city of Toronto. Toronto is the largest city in Canada and offers an urban hipster feel similar to that of New York. Toronto is home to towering skyscrapers downtown, fabulous shopping districts and loads of places to stay such as cabin rentals in Canada and affordable hotels. As North America’s fourth-largest city, you won’t get bored of things to do in Toronto. It’s also easy to get around the city with their efficient system of transportation. 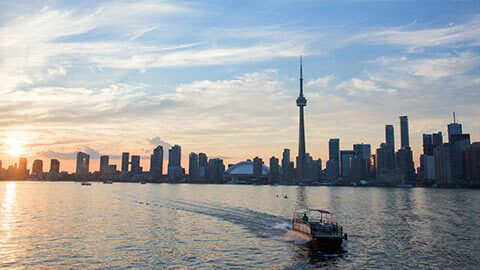 Springtime in Toronto can be a glorious time to visit the beautiful city. Temperatures average around 17C in May. Nevertheless, summers can be fantastic as well with temperatures around 25C in July and August. Torontonians enjoy sunny days during the fall with beautiful days and temperatures ranging from 20C in September to 16C in October. While winters can be a bit cold in North America, visitors can enjoy the host of indoor activities that are available during winter months. For those that love architecture as much as I do, a visit to the 1,815-ft CN Tower is a must to take in soaring views over Lake Ontario. There is also a host of fabulous museums to visit including the Royal Ontario Museum, the massive Art Gallery of Ontario and the unique Bata Museum, which offers a peek at a variety of shoes. If shopping and fine dining are more your speed, then head to local markets such as Kensington Market and St Lawrence Market which offer an array of luxury shops and restaurants. Queen Street West also offers a slew of hip fashions and designs to suit travelers needs as well. Furthermore, culture enthusiasts can enjoy ballet and theatre at locations like the Toronto Centre for the Arts, the Princess of Wales Theatre and the Royal Alexandria Theatre. Additional attractions include the Toronto Islands, which is a village-like community only 15 minutes away by ferry from the mainland. The islands offer fantastic views of the city skyline for architecture enthusiast. Furthermore, Toronto boasts Canada’s largest indoor aquarium Ripley’s Aquarium of Canada is a major appeal for those with families in order to see the rainbow reef and planet jellies full of shimmering jellyfish. If you are looking to travel to Toronto during the winter, then you can’t miss the Winterlicious festival, which features culinary delights of fixed menus from more than 200 of city’s top restaurants. The dining event offers an array of fine dining experiences, including cooking classes, dinner theatres, tastings and intimate dinners with chefs. Another winter festival includes the Cavalcade of Lights, a bustling winter escape of music, skating, fireworks and adoring glittering lights. This year due to the 150th birthday of Canada, Toronto is also hosting a yearlong celebration of cultural events with the To Canada with Love program. During the summer, the city also plays hosts to the Indigenous Arts Festival, the Cultural Hotspot festival and architectural festival Doors Open Toronto. Toronto offers a lively cultural scene including jazz bars, rooftop bars, and private cocktail lounges. With live music nightclubs such as Apt 200 and The Libertine, globetrotters would not get bored in Toronto. For the live music lovers, you can watch performances at the Air Canada Centre, Rogers Centre, Massey Hall and the Sony Centre for the Performing Arts from jazz to rock and roll. After forty years in the game, The Rex Hotel Jazz & Blues Bar offers live musical shows nightly. Another hip nightlife spot is Betty’s/Pacific Junction Hotel. Betty’s offers affordable eats like po’boy sandwiches, conch fritters, tasty cocktails, hip music spun by an in-house DJ and even a ping pong table for fun. For those looking for a more upscale scene, head to The One Eighty which offers panoramic rooftop views. As Canada’s highest outdoor patio 51 floors up, the views are incomparable. Relax while taking in the views, sipping on a delicious cocktail. One can also head to C’est What? Near St Lawrence Market, which offers 42 local craft beers, music, and even comedy gigs some nights. In the end, no matter if you are looking to trot to Toronto during the spring or summer, for shopping or festival hopping, you can’t go wrong visiting the dynamic city globetrotters. With a host of restaurants, bars and theaters to keep you entertained, Toronto is the perfect location for globetrotters to unwind.